Did you know the right roofing can actually save you money on your monthly bills? Metal roofing is a great way to make your roof work for you! The insulation properties of metal roofing will help lower your HVAC bill all year around, while still being an excellent barrier from harsh weather conditions, including heavy rains. There are many benefits to metal roofing, and this list will show you how exactly how metal roof can save you money over the life of your home and help put your mind at ease. Metal roofing needs virtually no maintenance because its slick surface is easily rinsed during regular rains. Additionally, there is a minimal chance that you'll ever experience a leak over the life of your home, which will prevent the need to hire a roofer for repair services. Metal roofing reflects the sun's rays, keeping the inside of your home cooler on those hot summer days. Traditional concrete, wood, clay and stone roofing styles absorb more heat, causing the interior to heat up and offset your air conditioning efforts. Many traditional roofing materials need to be replaced every 20 years or so, and those roofing materials often end up in landfills. Metal roofing is generally made of recycled material and can often be installed over your current roof without removing the material that is already there, keeping it out of the landfills. 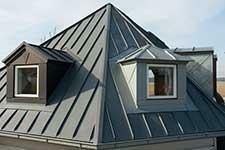 Metal roofing can be installed to represent many traditional styles of roofing or to give it a more unique look. It can mirror the look of shingle or tile roofing, or give your home a modern look with corrugated metal roofing or standing seam metal roofing. Metal roofing is available in a variety of colors to perfectly top your home. A metal roof can last 100 years or more, providing you with a lifetime of worry free roofing. So not only are you getting great protection from the elements, you no longer have to think about roof replacement in the future. Metal roofing is a great investment for all homeowners, as it can also help increase a home's value. For beautiful metal roofing installation in McKinney, Wichita Falls, or throughout North Texas, reach out to Trifecta Roofing & Construction. We offer beautiful metal roofing for residential properties. We'd be happy to discuss other types of roofing, including shingle and tile, if you're not sold on the benefits of metal roofing. To request an estimate for professional residential roofing in North Texas give us a call at (469) 620-7672 and we'd be happy to help you!